National Football League teams occasionally flirt with the ignominy of a winless season. The Cleveland Browns made a concerted effort last year. But none can match the futility of the Tampa Bay Buccaneers in their first two seasons in the league: 0-14 in 1976, then 0-12 in 1977 before winning their last two games of the season. Lifelong Bucs fan Jason Vuic has a thing for losers. One of his other books is about the Yugo, the worst car in history. Nobody’s been behind a bigger eight-ball. Skinflint owner, predictable offense, castoff players, ugly colors, wimpy logo. Player supply was the biggest problem because the expansion draft (since reformed) was rigged to permit established teams to protect all their good players, and the limited free agency rules of the day prevented a team from buying its way to respectability (not that Culverhouse would have been tempted). One of the Bucs’ stars, defensive end Pat Toomay, was left unprotected by the Dallas Cowboys as punishment for the heinous offense of writing a book. The ‘76 Bucs provided a taste of things to come by going 0-6 in the exhibition season. They lost their first official game 10-0 to Houston, and the last game of the season 31-14 to New England. The dozen losses in between included a near-miss (Miami beat them 23-20) and a loss to Seattle, the other expansion team. Lowlight came in Denver where the Bucs had a 3-point lead in the second half before yielding a record 38 points in nine minutes. The ‘77 season served up more of the same, except that the defense was getting decent and the games low-scoring. The Bucs lost three games 10-0. The streak finally ended in December in New Orleans, when the Bucs took a 20-0 lead and hung on to win 33-14, after which the Saints brass made a public apology. The Bucs’ plane ride home was a party of legend, but players recovered sufficiently from their hangovers to win the last game of the season at home. The streak put Tampa on the map, thanks to relentless jabs in Johnny Carson’s monologues. The fans embraced the experience. In 1977 they sported “Go for 0” t-shirts, and home attendance was among the highest in the league. Finally winning was a disappointment for some. The book is not a first-person account, as the subtitle might suggest (Vuic was three years old in 1976). Nor is it limited to the two years of losing. Vuic continues with the Bucs making the playoffs a few times with quarterback Doug Williams, then settling in for a couple of decades of sub-mediocrity. With new owners, colors, logo, coach, you-name-it, the team miraculously won the 2003 Super Bowl but has been pretty bad ever since. True to their roots, the Bucs still dominate the wrong end of the record book. Their all-time winning percentage of .385 is the worst in the league, and their streak of 14 consecutive losing seasons looks unassailable. Vuic might have played the story for laughs at the expense of the hapless team. Or centered it on the dysfunctional ownership and the collusion and conflict of big egos—Culverhouse, McKay, Spurrier. Or made it a tale of struggle and eventual redemption. He does some of all three, but The Yucks! Is essentially a straightforward and thoroughly researched chronology of the early days of the franchise, complete with a mid-book photo spread. It’s fast-paced at game time or when following McKay to a press conference, slower in the clubhouse covering the endless series of player moves. 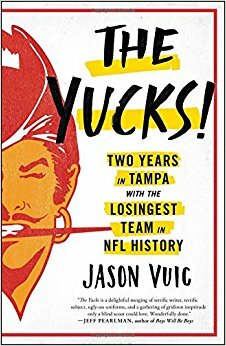 The book is must-read for Bucs fans and an entertaining dip into odd times in NFL history for the rest of us. Steve Spurrier may be college football’s most accomplished individual. He won the Heisman trophy and Walter Camp award in 1966 and was the third overall pick in that year’s NFL draft. His NFL career was not as successful as his college career, but he played for ten seasons. Spurrier’s best achievements came when he turned to coaching at the college-level. He won over 80% of his games at UF and won a national championship in 1996, the same year that he became the only Heisman trophy winner to coach a Heisman trophy winner. After a brief stint coaching the Washington Redskins in 2002-2003, Spurrier returned to coaching college and turned a perennial loser, South Carolina, into a top ten program. His visor-clad image and wide open offensive system have become fixtures in college football. His brash demeanor not only built winning football teams but also created legions of haters, particularly among the fans of teams his defeated. In Spurrier: How the Ball Coach Taught the South to Play Football, Ran Henry looks behind Spurrier’s career and shows how his father’s character molded Spurrier's. A Presbyterian minister, Reverend John Graham Spurrier had taken a job in Miami Beach when Steve Spurrier was born. Reverend Spurrier’s preaching was a bit too serious for the moneyed congregation, so by the time Steve Spurrier was one year old, he was moving back to the Deep South, a place that respected seriousness in their preachers, or at least didn’t run them out of town for it. To Reverend Spurrier’s credit, he seemed to learn from his experience and never lost a preacher job again. He would move for a better opportunity for his children, but not because he couldn’t manage his congregation. Steve Spurrier’s father encouraged his son to play sports. After every game, his father would go over what Steve had done right and done wrong. According to the book, his father always said, “You could have done a little bit better.” This type of fierce attention to detail is visible in Steve Spurrier’s coaching. And the iconic image displayed in the book's prologue, of Steve Spurrier throwing his visor in disgust at a mistake his quarterback made as Spurrier tried to coach up his quarterbacks in preseason, shows how strong his demand for perfection is. Losing hit Stevie the hardest. He couldn’t stand falling behind. When the other team scored and a comeback didn’t look likely, he started crying. Then he grabbed the ball and ran off the field. “I’m going home,” he yelled over his shoulder. “Leave the football!” Graham hollered. Everyone else yelled, too. “Why are we always using Stevie’s ball?” Bunny had to ask. I enjoyed the image of a young Steve Spurrier taking his ball and going home. Hatred of losing makes winners, and if nothing else, Steve Spurrier has been a winner. Steve Spurrier’s career as a head coach alone has spanned twenty-five years, and Mr. Henry covers that and more in this biography. 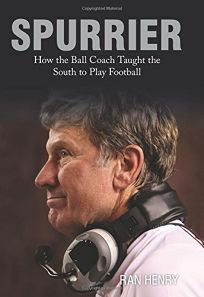 As a consequence much of the book, covering Spurrier's career, reads like newspaper clippings rather than an in-depth biography, a river of paragraph sized description of games and seasons rather than a coherent narrative. It became extremely difficult to place myself as a reader both within the narrative and within Steve Spurrier’s life. I often wondered what year it was or where we were and because of that had a hard time connecting with the story. Perhaps if Ran Henry had focused on a specific time period or a specific season in Spurrier's adult life and elaborated on it the way he did Spurrier’s childhood, the book would have been a more balanced and engaging read. Howard Schnellenberger has led an eventful football life: high school teammate of Paul Hornung, coached by and with Bear Bryant, assistant to Don Shula during the Dolphins' perfect season, coach of the University of Miami's first national championship team, founding coach at Florida Atlantic University. He's as recognizable for his personal traits as his coaching accomplishments: stylish sidelines wardrobe, pipe (earlier in his career), silver hair (later), moustache (throughout), gravelly voice, and quotability. Plus, as the subtitle reminds us, that dose of swagger, which became legend when he took over a moribund program at UM and declared the intention of a national championship in five years. Then he delivered on schedule. Swagger, however, plays only a small role in Passing the Torch. The dominant themes are generosity and patience. Schnellenberger tells the story of how he has taught what he learned, while giving recognition all around. The first chapter is a thank-you to his five main mentors--Bryant, Shula (who wrote the book's foreword), Paulie Miller (his high school coach), Blanton Collier (his coach at Kentucky and then boss when he joined the staff), and George Allen (who got him into the professional coaching ranks). Over 100 college players recruited or coached by Schnellenberger have made it to the NFL (an appendix lists them), but he mentions many, many others as well. Like any good coach, he has a soft spot for the walk-ons. He was especially good with quarterbacks, having coached Joe Namath, Kenny Stabler, Bernie Kosar, Vinny Testaverde, and Bert Jones. Acknowledgement and implicit thanks are also there for college administrators and support staff, opposing coaches and players, everyone who helped the team building happen. The only harsh words are for UM president Tad Foote, who strangely turned on Schnellenberger after the championship season; Jimmy Johnson, who succeeded him at UM and refused to acknowledge that a helluva torch had been passed his way; and the fans and boosters during his brief stint at Oklahoma who were rude to his wife Beverlee. The patience has to do with how he built football programs. Schnellenberger wanted his teams to make rapid progress, but he acknowledged that success takes time. He believes in gaining experience and toughness by playing over one's head. A loss is never as good as a win, but some losses teach you a lot. His early Florida Atlantic teams regularly played Division 1 opponents while still new to 1AA. The school went from inception to Division 1 to a bowl game in record time. He writes about building programs the "right way," starting with aggressive recruiting of local talent. Academic standards have to be met. You need good facilities for team conditioning and practices. And for fans--he was behind stadium projects at both Lousiville and Florida Atlantic. Community outreach was also part of the formula; he spoke to 200 groups in Miami-Dade before he coached a game at UM. If you make a career of building or rebuilding college football programs--as Schnellenberger did at Miami, Louisville, and Florida Atlantic--your overall won-loss record suffers. Over 27 seasons, he was just seven games over .500. But when his teams got good, they got very good. He is 6-0 in bowl games, and no other coach has won as many without a loss. Patience pays off. Sections of Passing the Torch are almost sports reporting, accounts of seasons, games, key plays. But the details are well-chosen so the action moves along. More in Schnellenberger's voice are the accounts of his relationships with players and coaching colleagues, and of his career missteps, including flirting with the USFL, overconfidence as a rookie pro coach, and that one year at Oklahoma. The few sections on coaching philosophy are predictable, but those on coaching methods are revealing. The book is remarkably light on self-congratulation. Praise is reserved for others, especially Beverlee, the staunchest of teammates. Passing the Torch is a fan's book, a lot of football packed into 300 pages. Finding Home is a memoir written by Maruchi Mendez in the form of a book-length letter to her late son, Ramiro “Toti” Mendez, a 1998 All-American pitcher raised in Miami, who died during his sophomore season as a player on the Florida International University baseball team as a consequence of a heart condition detected too late. The book begins on the day of Toti’s funeral in April 2000. The “Untold Secret” of the subtitle, known to others in the family but never told to Toti, is revealed to the reader in the next two chapters: he was adopted as an infant in Spain in 1980, through a process so private that the doctor says, “For all intents and purposes, Mrs. Mendez, you gave birth to this child in this clinic on this day.” Though it might seem that much has been given away early, Mendez’s narrative keeps opening up new layers of secrets and discoveries. Mendez, her first husband (father of her first three children), and her second husband,Toti’s father Ramiro, were all born in Cuba, and their displacement to Florida laid the foundation for lives that entwine ambition, disappointment, and what Mendez calls an “ever-evolving nostalgia.” Promise is often unfulfilled, marriages don’t endure, and a successful business or a beautiful home can’t guarantee security. In particular, Ramiro’s complex character propels an adoption surrounded by mysteries, and he soon puts pressure on Toti to excel. As a little boy, Toti stands out for his “quick defensive hands, strong throwing arm, and sharp hitting,” traits that may show he is, as one witness to his birth hinted, the biological son of a jai-alai star. At the same time, he is an inexplicably slow runner. Responding to his father’s avid coaching, and, later, wanting to prove himself to other coaches, he pushes himself to become a fiercely disciplined athlete, which leads to great achievement and, very possibly, his death. Baseball in Miami is not just a sport, it is a religion and a culture. It’s not surprising that nearly every little league program in the city is run by one baseball-obsessed Cuban dad or another. And it’s inevitable that Miami is full of great young baseball players, many of whom become Major League prospects. A high school’s baseball program , therefore, becomes the measure by which many parents will evaluate whether a school is “good” or not. Both public and private high schools arrange their schedules carefully, trying to avoid embarrassing mismatches. In such a place, we understand that winning state and national titles and becoming Dade County’s Baseball Player of the Year is an accomplishment indeed. In the course of the book, Toti comes across as a sweet, determined, and honorable boy who grows into a star almost as a duty. Perhaps he is idealized, but other characters are complex, including Mendez’s two troubled older sons. Mendez herself, as she tries to make things come out well, grapples with all that she can't control, and occasionally (satisfyingly) loses her temper, is the person we wind up knowing best. The “you” form in which Mendez addresses Toti, sustained through the book, shows the power of the author’s emotional bond to her lost child. In early sections, where she is covering material Toti could not have known, it’s as if the reader is listening in while Mendez reveas what she’s failed to find a way to tell him in life. At later points, when she recounts events that Toti was aware of, some of the shifts to “you” made me pull back, realizing that this device was not necessary for information that could go directly to the reader. But there aren’t many such spots, and the final chapters of the book, covering time after Toti’s death, reclaim the power of the opening. What begins as a personal story becomes, in the late sections, part of a larger issue in youth sports. Mendez notes that young athletes’ physical skills are scouted, timed, tested, and recorded in precise detail, but they get only routine physical exams that cannot detect hidden damage to their hearts. Mendez writes, “...according to the Center for Disease Control in Atlanta, 100,000 young men and women die each year from cardiovascular disorders, including cardiomyopathy, as a direct result of their participation in sports. That is twice as many as those who die in auto accidents.” And, “The mortality rate for pediatric and adolescent cardiomyopathy is higher than that of childhood cancer,” yet far less research money is devoted to the condition. Athletic associations claim fuller testing would be too expensive. (Though one also wonders whether there’s a reluctance to admit that sports can do such damage, as has also been the case for concussions till recently.) Mendez’s campaign for change in state law has so far not prevailed. There has been some improvement in the quality of preseason screenings, but Mendez argues that echocardiagrams for all athletes are needed, along with more research. “How much is a life worth?” is a question Mendez says she has asked repeatedly. In this case, one too-short life has driven a mother to write a book that will cause other parents to ask the question, too, and, one hopes, to press for greater understanding of the risks of sports and investment in testing, research, and education. And at another level, Finding Home emphasizes the importance for everyone of communicating with those you care about while you can. Lynne Barrett is the author of Magpies, winner of the Florida Book Awards Gold Medal in General Fiction, and editor of The Florida Book Review. You can learn more at her website. I remember where I was the first time I heard Tim Tebow’s name: sitting on a barstool at Buffalo Wild Wings in Jacksonville. ESPN interrupted their programming to broadcast Tebow’s announcement that he was taking his talents to the University of Florida. His was the first college commitment I recall seeing televised by a national network. In his memoir, Through My Eyes, co-authored by Nathan Whitaker, who also co-wrote Tony Dungy’s memoir, Tebow talks about the challenges of life and football. From the difficulties his mother faced while pregnant with him, to the issues and blessings brought on by his parents’ decision to homeschool him, through his rookie NFL season, Tebow credits family and, above all, his faith in Jesus Christ for everything he has achieved. The youngest of five children born to missionary parents, Tebow was, he tells the reader, a miracle baby. Early in the pregnancy, with the family living in Mindanao, their doctor called Tebow “a mass of fetal tissue” and “a tumor,” saying the only way to save his mother’s life was to have an abortion. The family instead prayed. Their prayers were answered when, according to Tebow, her bleeding ebbed and she was allowed to travel to Manila, where the facilities were better. There Tebow was born. God’s peace, his mother later told him, was how she endured the “pain, bleeding, and uncertainty” of her pregnancy. Through My Eyes reads much the way I imagine a one-on-one conversation with Tebow would go. As he details childhood struggles with dyslexia, sports related injuries and oft-criticized throwing mechanics, Tebow gives glory to God for his ability to overcome each challenge. His overt faith is what many of Tebow’s detractors point to when voicing their displeasure with him, but his memoir never comes off as preachy. Instead, Tebow speaks like someone who believes that everything he has in life is attainable for everyone and he wants to share the secret to obtaining it. Tebow’s love of football also pervades the book. Even in high school, he dealt with coaches telling him he couldn’t play quarterback. It’s no wonder Tebow handles scrutiny so well today: he’s had years of practice. He’s been dealing with coaches trying to convert him to tight end, fullback or defensive back since he was in Pop Warner. Tebow discusses the recruiting process, how he was courted by many of college football’s most storied programs—Notre Dame, Michigan, USC, Alabama and LSU, to name a few—before narrowing his choices to Alabama and Florida. I couldn’t help but feel for him as he described making the tearful call to then Alabama head coach Mike Shula to tell him personally that he won’t be heading to Tuscaloosa. The Gators won the national championship in Tebow’s freshman year, with him seeing limited playing time. Tebow was named the starting quarterback going into the 2007 season. He mentions his disgust at the sense of entitlement that set in among the players following the championship season, and the disappointing year that resulted. That season Tebow did become the first sophomore ever to win the Heisman trophy, though. To the fans and everybody in Gator Nation, I’m sorry. I’m extremely sorry. We were hoping for an undefeated season. That was my goal, something Florida has never done here. I promise you one thing, a lot of good will come out of this. You will never see any player in the entire country play as hard as I will play the rest of the season. You will never see someone push the rest of the team as hard as I will push everybody the rest of the season. You will never see a team play harder than we will the rest of the season. God bless. The Gators didn’t lose another game that season and beat the Oklahoma Sooners for the national championship. While at Florida, Tebow was asked to make numerous public appearances. This opened his eyes to the impact he could have upon people’s lives. After negotiating with the NCAA Compliance Committee, Tebow started an annual fundraiser in Gainesville, the profits from which went to the orphanage his parents established in the Philippines. Tebow uses his platform to address other issues, as well. He lets it be known that he thinks college athletes should be compensated, considering how much revenue college athletics generates. He also endorses the idea of a playoff system to determine the national championship in college football. In the off-season Tebow goes on missions to the Philippines, something he’s done since he was fifteen. 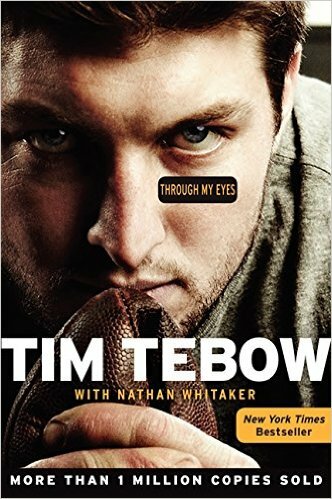 Through My Eyes follows Tebow through his rookie season with the NFL’s Denver Broncos, although few pages are devoted to it. He does mention those who doubted his ability to play quarterback at the highest level, and how they’ve driven him prove them wrong, as he has so many before. Few current athletes are as polarizing as Tim Tebow. Whether because of his devout Christianity or the unusual throwing motion most of those in-the-know in the sports world condemn him for, Tebow is a love-him-or-hate-him sports figure. I have a feeling that if his so-called haters were to read Through My Eyes they might be converted. It’s hard not to believe in this kid. On the outskirts of Lake Okeechobee, west of the glitz and wealth of Palm Beach, lies Belle Glade, a town devastated by decades of high rates of unemployment, poverty, and crime, a town where, for young men able to avoid the trap of gang-life, football is a way out. Belle Glade has one of the highest concentrations of “raw football talent” in the country. Glades Central High School, which boasts six state and twenty-five district championship titles, has sent thirty players to the NFL. Recently, an average of eight Raiders per year have gone on to play Division I (FBS) football and it is estimated that, in any given year, Glades Central has one hundred of its former players playing somewhere in North America. That number is jaw-dropping when compared to the national average of high school players drafted to the pinnacle of professional football (.08 percent, or eight per ten-thousand). 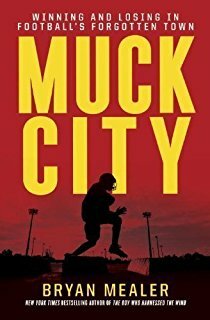 Bryan Mealer’s Muck City: Winning and Losing in Football’s Forgotten Town is a captivating narrative that follows a group of young Raiders, coached by Jessie “The Jet” Hester, one of Glade Central’s first players to go pro, trying to balance the struggles of life in an impoverished farming town with school and football. Muck City is named for its fertile, nutrient-rich, powdery black soil known as “muck,” because of which Belle Glade was once called the “Winter Vegetable Capital of the World.” The muck is also part of a tale that attempts to explain Belle Glade's ability to produce spry and speedy football players. Every November, when the cane crops are harvested and the remaining brush burned, muck rabbits flee the fiery fields into waiting crowds of young men who are said to develop their speed and hone their agility by catching the speedy hares. Those able to snare more elusive white-tailed rabbits are supposedly destined for greatness. As Mealer writes, no matter how the wealth of football talent in Belle Glade is explained, for most it is the only way out. “In Belle Glade, where the risk of joblessness, prison, or early death followed each boy like a toxic cloud, high school football was more than religion, it was like salvation itself—the raft by which to flee a ship that kept drifting back in time. Football offered an education, a chance at life." Mealer looks beyond football, though. He delves deep into the history of Belle Glade, from its formation as a result of the draining of the Everglades in 1906, to its being labeled the “AIDS Capital of the World” in 1985, and culminating with the industrialization of sugar harvesting in the early nineties, which led to the departure of cane cutters and their money. Despite its proximity to one of the country’s wealthiest areas, Belle Glade, with a population of 17,467, is one of the poorest. In 2009, the official unemployment rate was twenty-five percent, although it was estimated to be closer to forty. Football dominates Muck City, much as it does Belle Glade, where Central, cross-town rival Pahokee, and the private Glades Day have combined for nineteen state titles. Championships aren’t something hoped for, they’re expected. Hester finds himself having to live up to a town’s lofty expectations for its football coaches, expectations exacerbated by the fact that he is a prodigal son returned. Meanwhile, he relishes his role as mentor, even when trying to focus his six-foot-six wide receiver Kelvin “KB” Benjamin, whose recruitment by some of the country’s powerhouse programs has left him big-headed. Mealer details the recruiting process Benjamin experiences, as well as the demanding extracurricular schedule cheerleading captain Jonteria Williams puts herself through in order to realize her dream of becoming a doctor. Thanks to the negative portrayal of their town by the media over the years, residents of Belle Glade are reluctant to open up to reporters. In order to earn their trust, Mealer moved to Belle Glade while writing Muck City. That dedication to the people of Belle Glade jumps off the page. In the end I felt as if I knew the players he chronicled personally. Recently, while watching the annual game between in-state rivals the University of Miami and Florida State, I found myself rooting for KB, who chose FSU over the University of Florida. I smiled with Jonteria as she opened one scholarship offer after another. I felt bad for the seniors who walked off the football field for the last time, with no colleges knocking on their door offering scholarships in exchange for their talents. Like the silty black soil that “seeps into your socks and under toenails,” Muck City will stick with you. Ed Irvin, a Florida Book Review Contributing Editor, lives and writers in Boynton Beach, FL. This baseball season, Holman Stadium is the proud home of the Vero Beach Devil Rays, a minor league affiliate of Tampa Bay. The former Vero Beach Dodgers? They’re now the San Bernardino Inland Empire 66ers. And after six decades of training in the same place on the Florida coast every spring, the Dodgers themselves – formerly of Brooklyn, lately of Los Angeles – won’t be returning in February 2009. Well, okay, the Treasure Coast Palm, Vero’s newspaper, reports hints from the organization that they might be back next year if their new camp in Arizona isn’t ready by the time the pitchers and catchers begin to show up. But the writing is on the wall: Dodgertown is finished. Word has it the Orioles might move in if they can work out a deal with the city. Big whoop. So Rody Johnson’s The Rise and Fall of Dodgertown comes at a good time. The place has been eulogized by Sports Illustrated, ESPN, the NY Times, and USA Today, not to mention the LA papers; if you’ve never been there, the book explains what all the hoopla is about. If you have been there, you know. Dodgertown is the oldest spring training facility in baseball. To enter Holman Stadium you park on the grass west of the field, walk up Dodger Lane and turn right onto Duke Snider Street, then to the gate. The stadium is small, with a capacity of only 6500, and the players sit in open dugouts just a few yards from the fans in the open bleachers. It’s like watching a game in someone’s backyard. Holman didn’t even have a fence around the outfield until 1988; before that, the edge was marked by a grassy berm players sometimes ran over after long fly balls. Plenty of the anecdotes in Johnson’s book illustrate Dodgertown’s homey charm: In 1949 team president Branch Rickey forbade players from swimming in the ocean after a rookie third baseman was carried out to sea by an undertow and had to be rescued by an outfielder. Walter O’Malley, who acquired a controlling interest in the team in ’51, grew orchids at the facility and showed them off to visitors. Steve Sax, Dodger second baseman during most of the 80s, judged the Vero Beach High School Math Club Beauty Contest in 1981, his rookie year. Most heartstring-tugging for any baseball fan will be reading about the place at Dodgertown reserved for Roy Campanella, catcher for the Dodgers from 1948-1957. Campanella, a Hall of Famer, was one of the first black players in the major leagues and won the National League’s MVP award three times. His career was cut short in 1957 when a car accident fractured two of his vertebrae and paralyzed him below the shoulders. But two years later he returned to Dodgertown as a coach, and he kept coming back until his death in 1993 at the age of 71. “After dinner,” writes Johnson, “he sat out back of the barracks kitchen, ‘chewing the fat’ with whoever came along: the kitchen staff, his teammates, or the minor leaguers. That spot between the main reception hall and the mess hall became known as Campy’s Bullpen.” If there was any doubt, this is the proof: while it lasted, Dodgertown took care of its own. Johnson, the author of two other history books, has had ample opportunity to track down stories and factoids like these. Not only is he a long-time resident of Vero Beach – he was a teenager when the Dodgers came to town in 1948 – the Dodgers also allowed him use of the Dodgertown archive, which he draws on for the many photographs included in the book. Community knowledge and internal records, plus newspaper archives and previously published Dodger biographies and memoirs, allow him to present an exhaustive survey of the subject. In fact, his presentation could stand to be a little less exhaustive and a little more considered. The book is organized by year, starting in 1945 and ending in 2007. The problem with this? During some years, nothing very interesting happened. Do we really need to know that in the spring of 1973, then-team-owner “Peter O’Malley’s in-laws, who lived in Denmark, visited Dodgertown for the first time”? To fill out some years, Johnson seems to have made a note of every mention of Dodgertown in the local paper. Elsewhere he appears to be shouting out his favorite local places and people, as when he notes that Waldo Sexton’s Turf Club, where a group of Vero Beach citizens met to protest the city’s challenge to the Dodgers’ lease in 1961, is now the Szechuan Palace restaurant. Even for the most die-hard Dodger fan, this stuff must be too trivial to qualify as baseball trivia. This everything-you-never-wanted-to-know-about-Vero-Beach approach is particularly frustrating since Johnson skimps on background elsewhere. There are at least two fascinating stories to be told—one being how Dodgertown provided the early-integrated Dodgers a haven from Jim Crow laws, the other how free agency and rising player salaries destroyed the profitability of operations like Dodgertown, which, as investments in training up minor league talent, no longer paid significant dividends when veterans started pulling down the really big bucks—neither of which gets the background of national history it deserves. All of which is to say, The Rise and Fall of Dodgertown might be slow going even for Dodger fanatics. 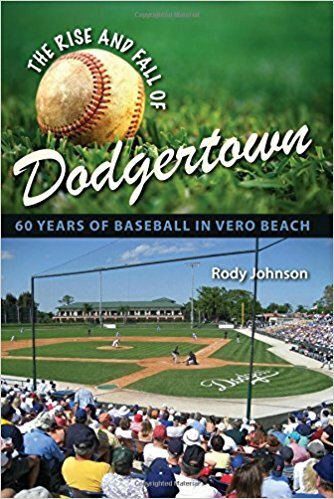 But it is an extremely complete reference work, and now that the team has up and left behind its history in Vero Beach, the book is the closest you can come to visiting the living, breathing Dodgertown. That alone makes it worth paging through. Jamie May is an MFA candidate at Florida International University. He lives in North Miami Beach. He's been to Dodgertown three times, and wishes it were more.